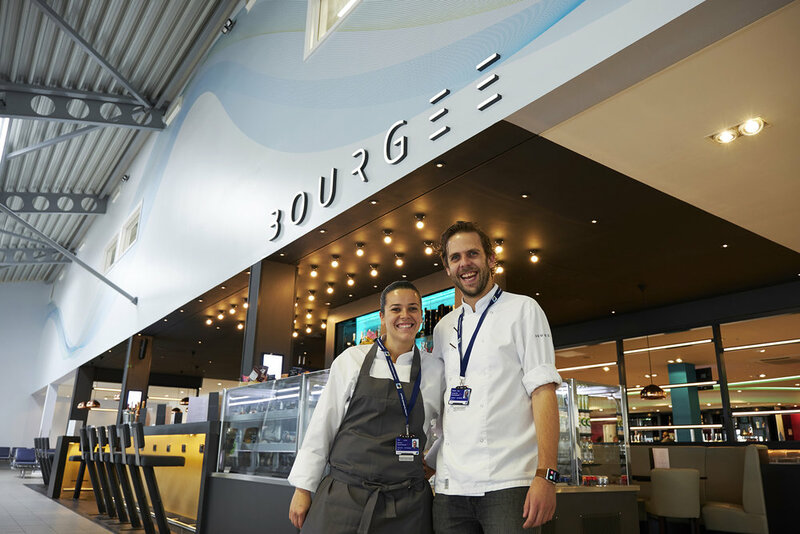 The new Bourgee bar at London Southend Airport marks Bourgee's first offering within an airport terminal. We developed their existing concept and adapted it to suit this very specific environment, whereby the chic and relaxed Bourgee experience can still be enjoyed by customers on the move. In addition to this, the Bourgee team have created a bespoke food and drinks menu that caters for customers' need for a quick turn around. The customer journey was a key factor in the development of the spatial layout and the design of the bar - we have streamlined the way customers use the space in the limited time available before boarding. Also, in the knowledge that potential customer numbers will flex according to departure times, we have included a mixture of high table seating and dining-style seating to maximise capacity within the bar area. During the design process we worked closely with Bourgee to identify specific brand benefits for customers, including charging points at all seating areas and storage slots for larger hand luggage. We developed the scheme from an initial concept to a deliverable solution, working with the client, the main contractor and a catering specialist.